Showing items in category British Levant, sorted by newest listed first. BRITISH LEVANT (Turkish Offices) - 1892 20p claret PSC to Portugal used at STAMBOUL. H&G 8. 1892 20 para dull claret postal stationery postcard of Turkey addressed to Lisbon in Portugal cancelled by oval STAMBOUL handstamp with circular STAMBOUL cds at left dated 15.APR.98. A scarce use of this Turkish stationery in Levant. H&G 8. BRITISH LEVANT - 1921 7 1/2p on 5d orange RPSE (size K) unused 'EX ARCHIVES'. H&G 20c. 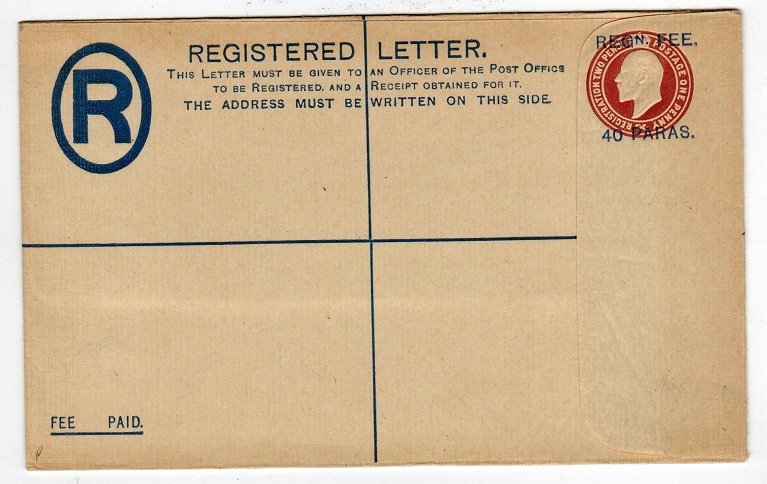 1921 7 1/2p on 5d orange registered postal stationery envelope (size K) in unused condition (folded vertically through center and ironed out)showing the 'G.P.' initials under flap. Ex archives stamped '1922' at top edge. A scarce size. H&G 20c. BRITISH LEVANT - 1922 7 1/2p on 4 1/2d claret RPSE (size K) unused 'EX ARCHIVES'. H&G 21c. 1922 7 1/2p on 4 1/2d claret registered postal stationery (size K) envelope in unused condition (vertical center fold ironed out) with 'J.Q.' initials under flap and ex archives having been stamped '1923' at top edge. Scarce thus. H&G 21c. BRITISH LEVANT - 1922 7 1/2p on 4 1/2d claret RPSE (size H) unused 'EX ARCHIVES'. H&G 21b. 1922 7 1/2p on 4 1/2d claret registered postal stationery (size H) envelope in unused condition (vertical center fold ironed out) with 'M.Q.' initials under flap and ex archives having been stamped '1923' at top edge. Scarce thus. H&G 21b. 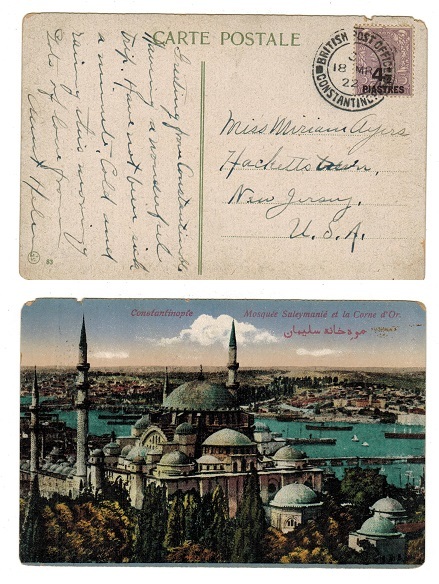 BRITISH LEVANT - 1923 use of 'GB' 1 1/2d adhesive on postcard to USA used at CONSTANTINOPLE. 1923 (MR.2.) use of picture postcard to USA depicting 'La Lecture Due Coran' (some bottom left corner creasing) bearing the GB 1 1/2d brown (un-overprinted) adhesive (SG Z190) tied by BRITISH POST OFFICE/CONSTANTINOPLE cds. 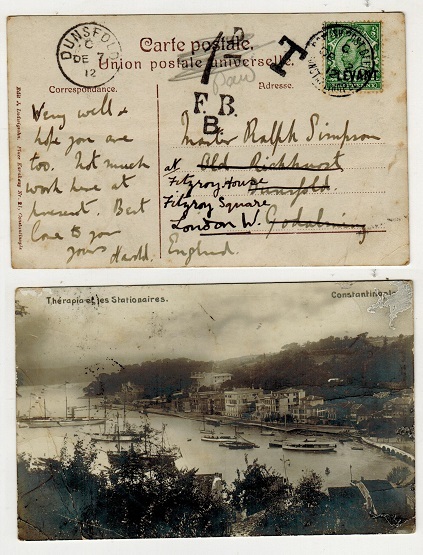 BRITISH LEVANT - 1900 GB 'QV' 1/2d pair (SG Z265) on postcard to Germany used at SMYRNA. 1900 (DE.7.) use of postcard addressed to Germany depicting 'Smyrne' bearing 'GB' QV 1/2d blue green pair (SG Z 265) tied BRITISH POST OFFICE/SMYRNA. 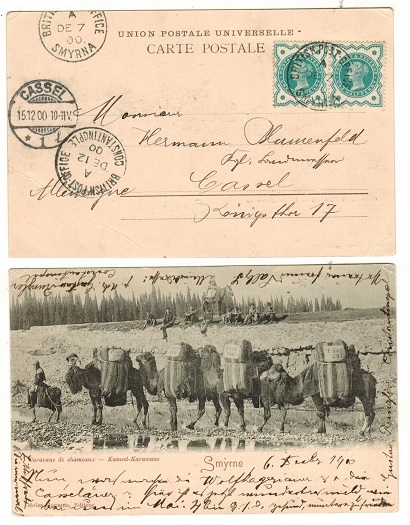 BRITISH LEVANT - 1900 GB 'QV' 1/2d (SG Z265) on postcard to Germany used at CONSTANTINOPLE. 1900 (OC.31.) 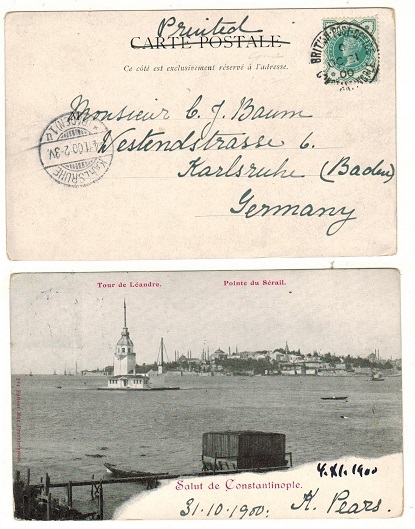 use of picture postcard addressed to Germany depicting 'Salut De Constantinople' bearing 'GB' QV 1/2d blue green (SG Z265) tied BRITISH POST OFFICE/CONSTANTINOPLE. BRITISH LEVANT - 1919 5/- GB 'seahorse' (crease) used at APO/CONSTANTINOPLE. SG Z186. 1919-20 5/- rose-carmine 'seahorse' adhesive of GB (ironed out crease) cancelled by very fine crisp BRITISH A.P.O./CONSTANTINOPLE cds dated 19.MR.20. SG Z186. 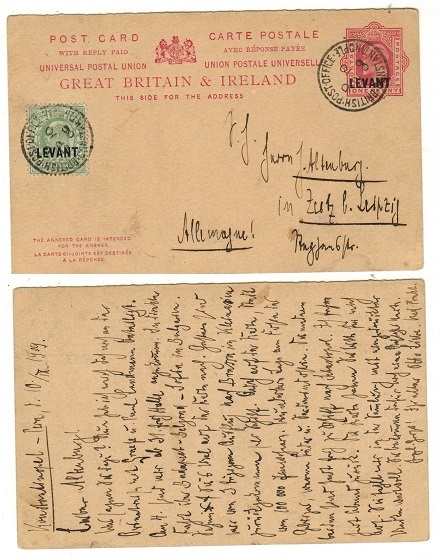 BRITISH LEVANT - 1905 1/2d green postal stationery wrapper uprated to Germany at SMYRNA. H&G 12. 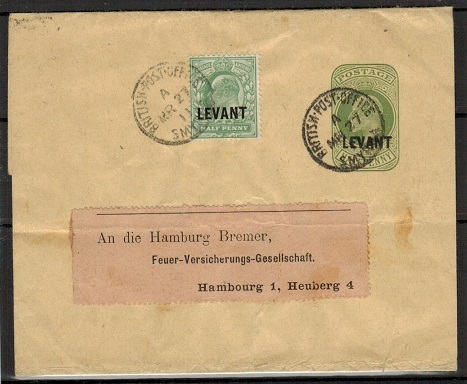 1905 1/2d green on buff postal stationery wrapper addressed to Germany with additional 1/2d 'Levant' adhesive applied and cancelled by BRITISH POST OFFICE/SMYRNA cds's dated MR.27.11. H&G 12. BRITISH LEVANT - 1921 18 3/4p on 1/- mint block of 25 with RAISED 3 IN FRACTION varieties. SG 47. 1921 18 3/4p on 1/- olive brown mint block of 25 showing the RAISED 3 IN FRACTION on Row 2/5 and 4/5. Some mild gum discolouration. SG 47. BRITISH LEVANT - 1893 40p on 2 1/2d PSE to Germany used at SMYRNA. H&G 1. 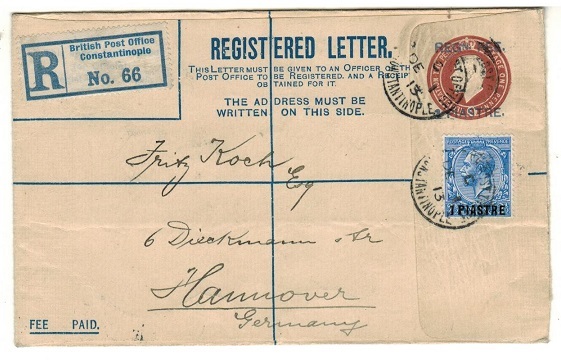 1893 40 paras black on 2 1/2d blue-grey postal stationery envelope addressed to Germany cancelled BRITISH POST OFFICE/SMYRNA and dated FE.29.96. H&G 1. BRITISH LEVANT - 1893 40p on 2 1/2d PSE used locally from STAMBOUL. 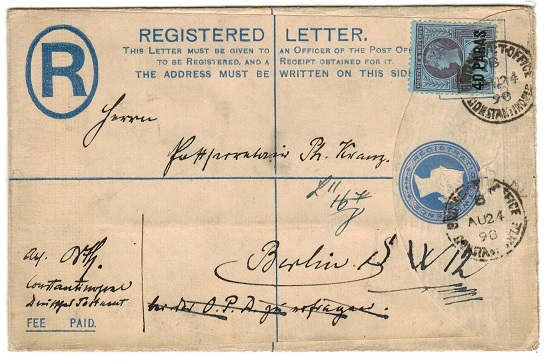 1893 40 paras black on 2 1/2d blue-grey postal stationery envelope addressed locally to Smyrna cancelled BRITISH POST OFFICE/STAMBOUL and dated AU.20.95. H&G 1. BRITISH LEVANT - 1893 40p on 2 1/2d grey-blue PSE uprated and registered to Syria. H&G 1. 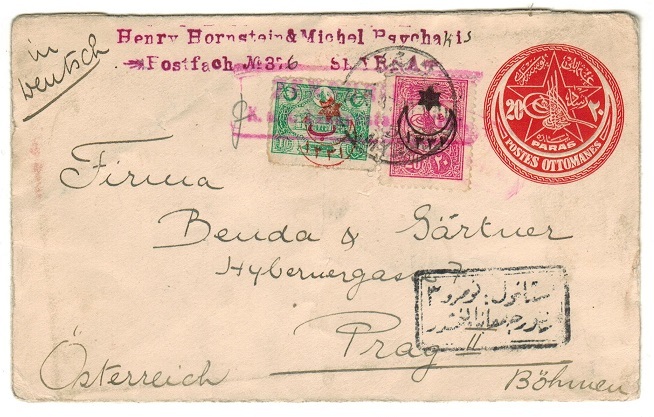 1893 40 paras on 2 1/2d grey-blue postal stationery envelope registered to Syria and bearing additional 80 paras on 5d adhesive tied BRITISH POST OFFICE/CONSTANTINOPLE and dated JU.29.98. H&G 1. BRITISH LEVANT - 1912 1p on 3d brown RPSE uprated to Germany used at CONSTANTINOPLE. H&G 19. 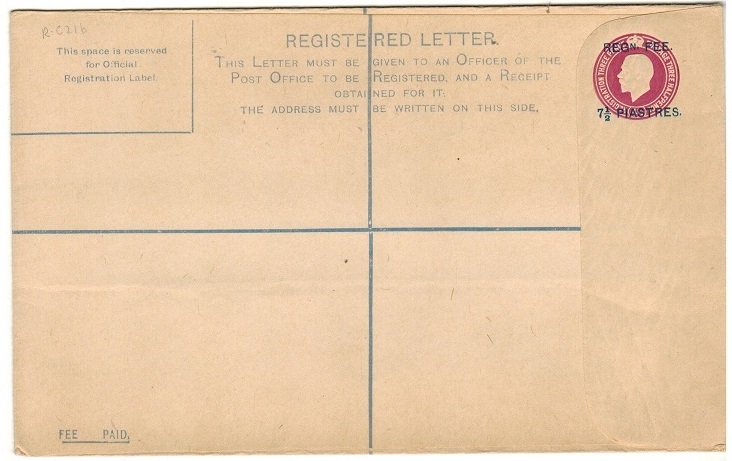 1912 1p on 3d brown registered postal stationery envelope (size G - without 'w') addressed to Germany and bearing additional 1p on 2 1/2d adhesive tied BRITISH POST OFFICE/ CONSTANTINOPLE and dated DE.1.13. H&G 19. BRITISH LEVANT - 1921 7 1/2p on 5d orange RPSE unused. H&G 20. 1921 7 1/2p on 5d orange registered postal stationery envelope (size F) in fine unused condition with 'JP' initials under flap. H&G 20. 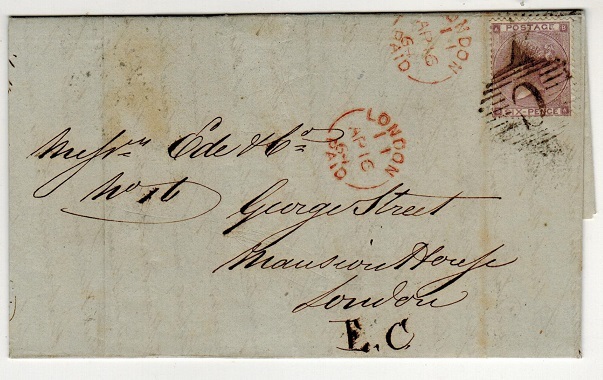 BRITISH LEVANT - 1860 cover to UK with 'GB' 1/- green tied by 'C' strike of CONSTANTINOPLE. 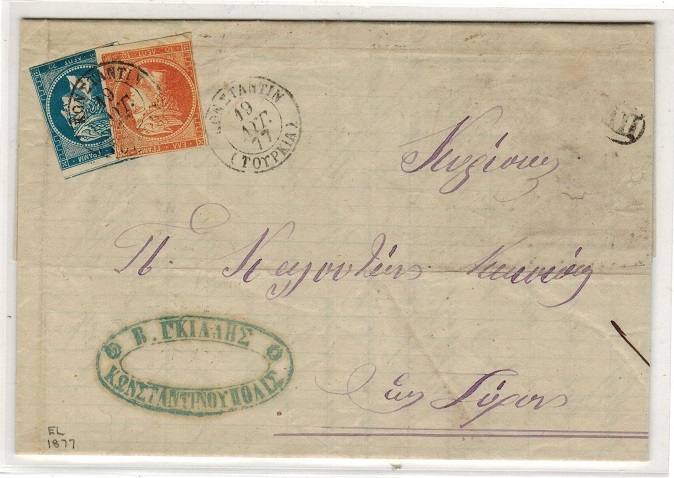 1860 cover addressed to UK bearing GB 1/- green tied by barred 'C' strike for Constantinople and with red LONDON/PAID arrival cds on front dated SP.6.60. (SG Z111). 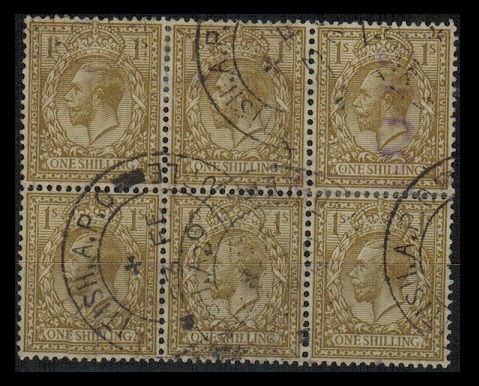 BRITISH LEVANT - 1864 entire to UK with 'GB' 6d lilac tied by 'C' strike of CONSTANTINOPLE. 1864 entire addressed to UK bearing 'GB' 6d lilac adhesive (SG type 28 with hyphen) cancelled by barred 'C' strike for use at CONSTANTINOPLE with red LONDON/PAID arrival cds's dated AP.16.64. Backstamped by BRITISH POST OFFICE/CONSTANTINOPLE cds dated AP.7.1864 code A cancel in black. BRITISH LEVANT - 1899 80 paras on 5d registered cover to UK used at SMYRNA. 1899 (DE.13.) 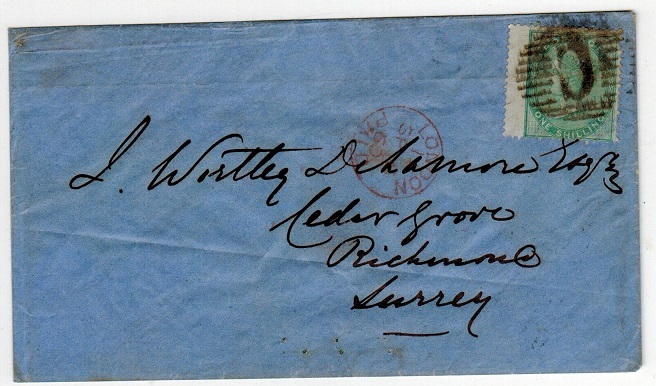 registered cover addressed to UK bearing 80 paras on 5d dull purple and ultramarine adhesive (SG 9) cancelled by neat oval REGISTERED/SMYRNA cancel with additional strike at left. BRITISH LEVANT - 1922 foreign postcard rate card to Belgium used at CONSTANTINOPLE. 1922 (MR.25.) 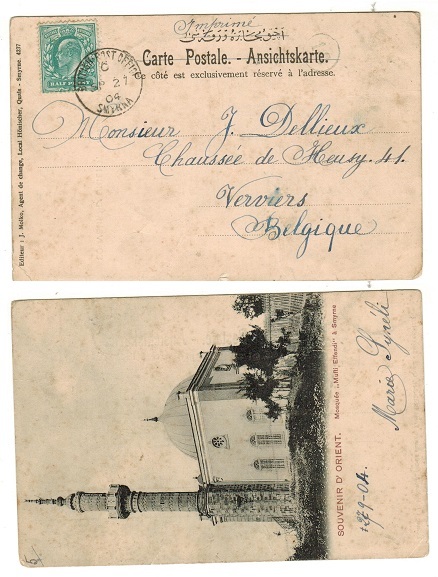 use of picture postcard addressed to Belgium depicting 'Constantinople-Eaux Douces d'Asie Bosphores' (picture inverted to card) bearing 3 3/4p on 2 1/2d and 30 paras on 1/2d adhesives (SG 41+43) making up the 3d foreign postcard rate tied BRITISH POST OFFICE/CONSTANTINOPLE. BRITISH LEVANT - 1923 foreign postcard rate card to Germany used at CONSTANTINOPLE. 1923 (MR.6.) 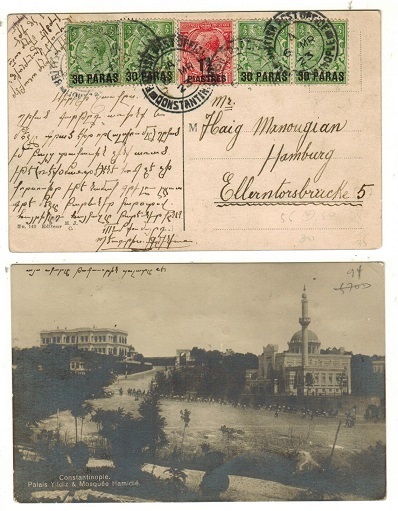 use of picture postcard addressed to Germany depicting 'Constantinople-Palais Yildiz & Mosuee Hamidie' bearing 1 1/2p on 1d tied with four examples of the scarce 30 paras on 1/2d green (SG 41) tied by BRITISH POST OFFICE/CONSTANTINOPLE cds's. Paying 3d foreign postcard rate. BRITISH LEVANT - 1904 1d (GB) rate (un-overprinted) postcard use to UK from CONSTANTINOPLE. 1904 (JY.20.) 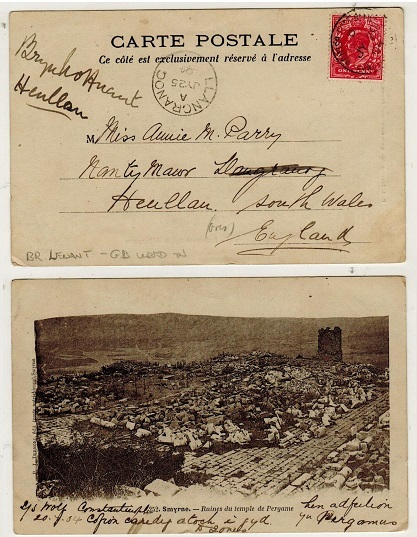 use of picture postcard addressed to UK depicting 'Smyrna-Ruines Due Temple de Pergame' bearing GB Edward VII 1d red adhesive (un-overprinted) tied by large part BRITISH POST OFFICE/CONSTANTINOPLE cds. BRITISH LEVANT - 1909 5pi on 1/- (x4) on piece used at CONSTANTINNOPLE. SG 21. 1909 5pi on 1/- dull green and carmine (x4) affixed to small piece and cancelled by central BRITISH POST OFFICE/CONSTANTINOPLE cds dated JU.11.13. SG 21. BRITISH LEVANT - 1909 5p on 1/- dull green and carmine mint SPECIMEN. SG 21s. 1909 5p on 1/- dull green and carmine in fine mint condition with 'horse shoe' SPECIMEN applied in black. SG 21s. BRITISH LEVANT - 1902 80p on 5d, 4p on 10d and 12p on 2/6d mint SPECIMENS. SG 9s-11s. 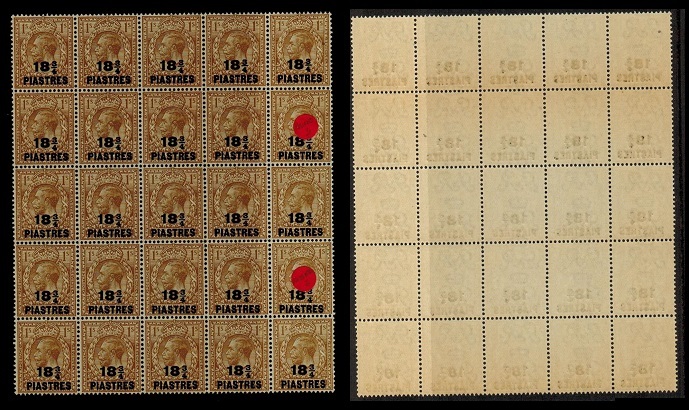 1902 80p on 5d, 4p on 10d and 12p on 2/6d adhesives each in mint condition (5d and 10d lightly overall toned and 2/6d with gum bend) each handstamped SPECIMEN in horse shoe figuration. SG 9s-11s. 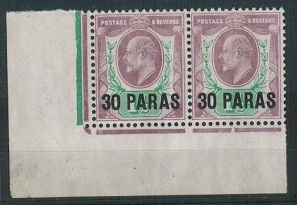 BRITISH LEVANT - 1920 (circa) use of 'GB' 5/- vertical pair used at CONSTANTINOPLE. 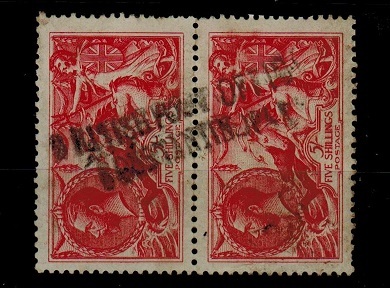 1920 (circa) 'GB' 5/- rose-red 'seahorse' vertical pair struck by literally complete two lined BRITISH POST OFFICE/CONSTANTINOPLE handstamp in black. A very scarce use of this parcel cancel on GB stamps used in Levant. BRITISH LEVANT - 1920 use of 'GB' 1/- block of six at APO/CONSTANTINOPLE. SG Z184. 1920 (FE.33.) 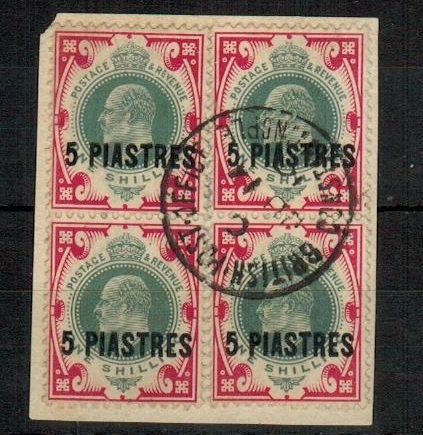 use of a 'GB' 1/- bistre block of six adhesives tied by BRITISH A.P.O./CONSTANTINOPLE cancels. A scarce multiple. SG Z184. BRITISH LEVANT - 1904 80p on 5d registered cover to USA used at SMYRNA. 1904 (AP.2.) 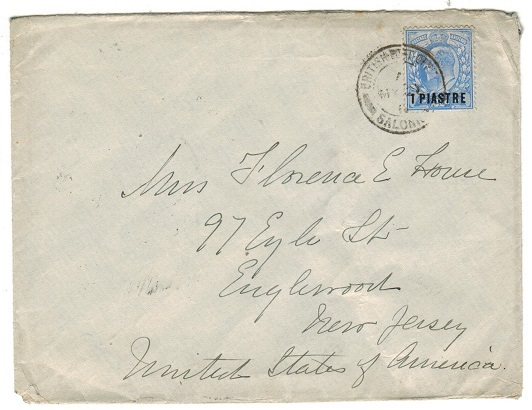 registered cover addressed to USA bearing 80 paras on 5d adhesive (SG 9) cancelled by fine oval REGISTERED/SMYRNA cancel. 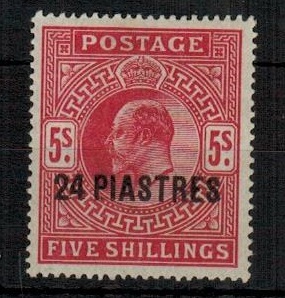 BRITISH LEVANT - 1912 1d bright scarlet (redrawn) 'B 12' control block of six fine mint. SG L15. 1912 1d bright scarlet (redrawn) mint 'B 12' control block of six in fine mint condition. SG L15. BRITISH LEVANT - 1912 1d bright scarlet (redrawn) 'B 12' control block of six mint. SG L15. 1912 1d bright scarlet (redrawn) mint 'B 12' control block of six in mint condition. Some light tone spots. SG L15. 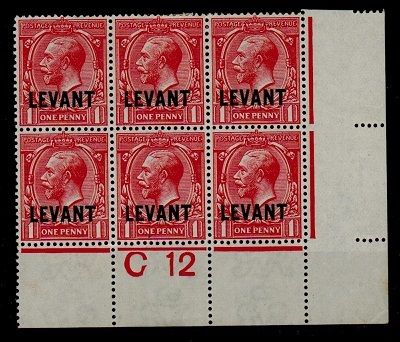 BRITISH LEVANT - 1912 1d carmine-red in a mint 'A 11' control block of six. SG L13. 1912 1d carmine-red in a mint 'A 11' control block of six. Few off tone spots and light ironed out gum bend on left vertical pair. SG L13. 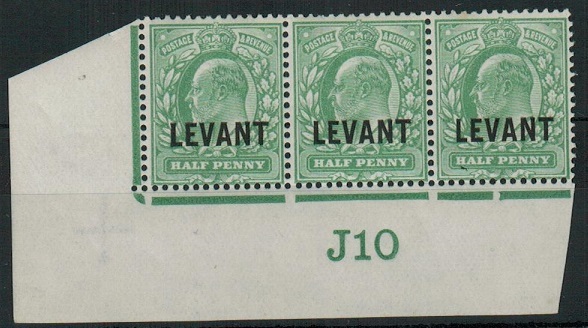 BRITISH LEVANT - 1912 1/2d green (re-drawn) mint 'B 12' control block of six. SG L14. 1912 1/2d green (re-drawn) mint 'B 12' control block of six. Light tone spots and ironed out gum crease. SG L14. BRITISH LEVANT - 1911 12pi on 2/6d dull greyish purple mint. SG 33a. 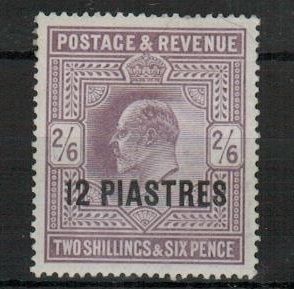 1911-13 12pi on 2/6d dull greyish purple 'Somerset House' printing adhesive in fine mint condition. SG 33a. BRITISH LEVANT - 1911 24pi on 5/- carmine mint. SG 34. 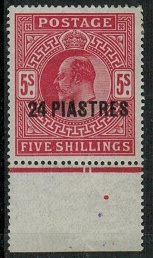 1911-13 24pi on 5/- carmine 'Somerset House' printing adhesive in fine mint condition. SG 34. BRITISH LEVANT - 1912 1p on 2 1/2d rate cover to Italy used at SMYRNA. 1912 (MY.26.) 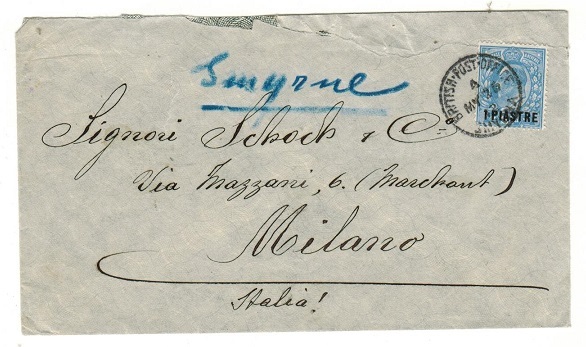 cover addressed to Italy (roughly opened at top) bearing the 1p on 2 1/2d bright blue adhesive printed by 'Somerset House' (SG 27) tied BRITISH POST OFFICE/SMYRNA. BRITISH LEVANT - 1905 outward 1d+1d section of the PSC uprated to Germany. H&G 18. 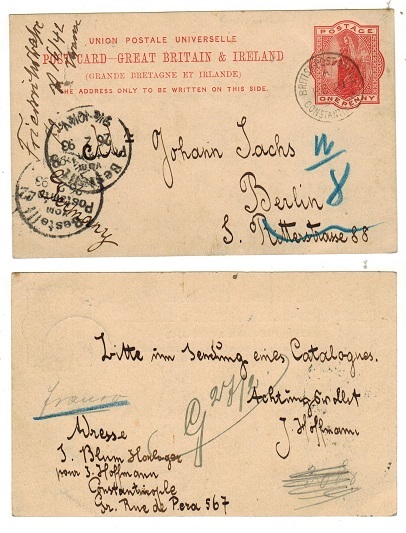 1905 outward section of the 1d+1d carmine on cream postal stationery reply type postcard addressed to Germany (long message on reverse) uprated with additional 1/2d adhesive overprinted LEVANT and cancelled by BPO/CONSTANTINOPLE cds dated SP.10.09. This card having the 'This Side For Address'. H&G 18. 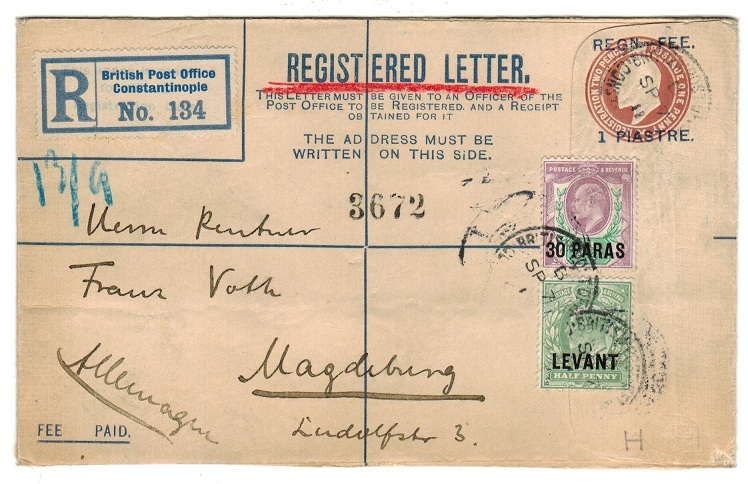 BRITISH LEVANT - 1913 1/2d rate underpaid postcard to UK with 'T' tax mark. 1913 (DE.2.) use of picture postcard addressed to UK (creased at left) depicting a real view of Therapia et les Stationaires, Constantinople bearing 1/2d 'Downey head' adhesive overprinted LEVANT tied by BRITISH POST OFFICE/CONSTANTINOPLE cds and being underpaid having scarce 'T' tax mark applied. DUNFORD arrival and 1d /F.B./B. strike applied in UK. A nice scene. BRITISH LEVANT - 1922 22 1/2p rate registered cover to UK used at CONSTANTNOPLE. 1922 (DE.18.) 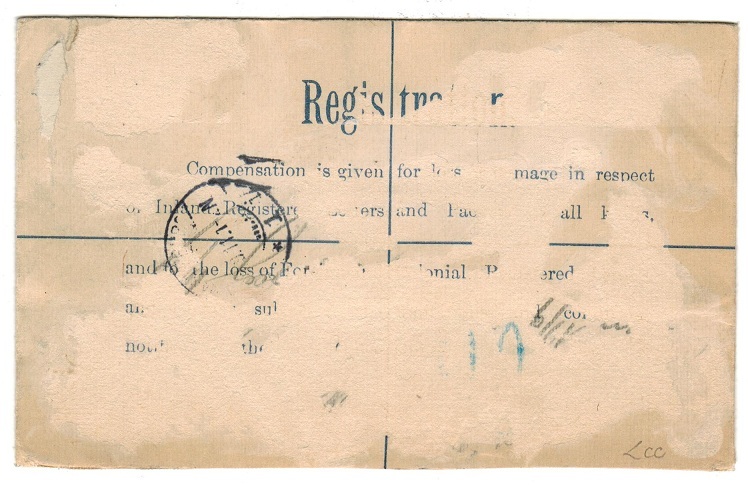 registered cover addressed to UK (central fold) bearing 7 1/2p on 5d and 15p on 10d adhesives making up a more unusual 22 1/2p rate tied BPO/CONSTANTINOPLE. BRITISH LEVANT - 1912 1/2d dull yellow green 'Somerset House' adhesive u/m. SG L11. 1912 1/2d dull yellow green (perf 14) 'Somerset House' printing adhesive in fine unmounted mint condition. SG L11. BRITISH LEVANT - 1922 4 1/2p rate postcard use to Belgium used at CONSTANTINOPLE. 1922 (SP.20.) 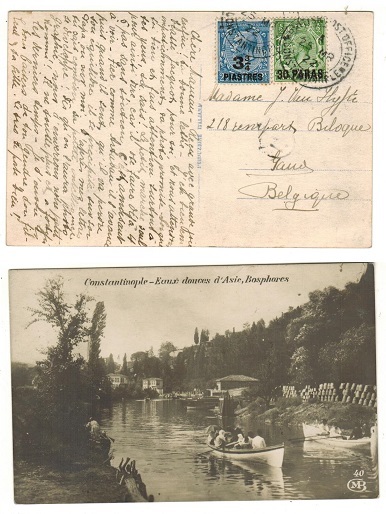 use of postcard addressed to Belgium depicting 'Constantinople' and bearing 4 1/2p on 3d adhesive tied BPO CONSTANTINOPLE. 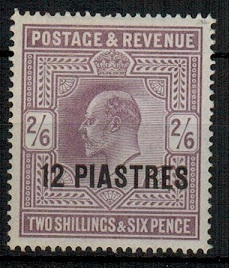 BRITISH LEVANT - 1922 7 1/2p on 4 1/2d claret RPSE unused. H&G 21. 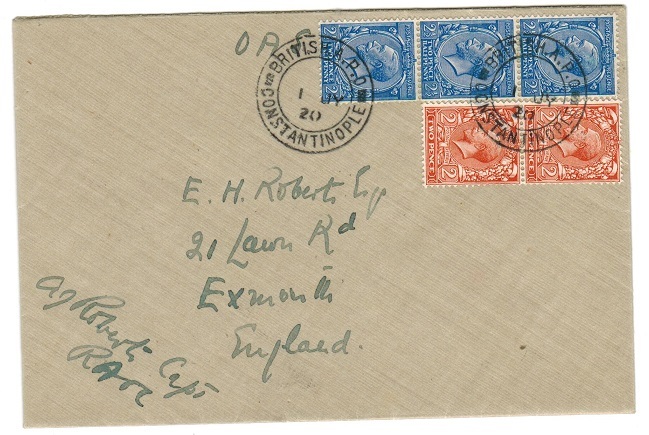 1922 7 1/2p on 4 1/2d claret on buff postal stationery envelope (size F) in fine unused condition showing the 'A.R.' coding under flap. H&G 21. 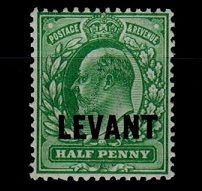 BRITISH LEVANT - 1922 7 1/2p on 4 1/2d claret RPSE unused. H&G 21b. 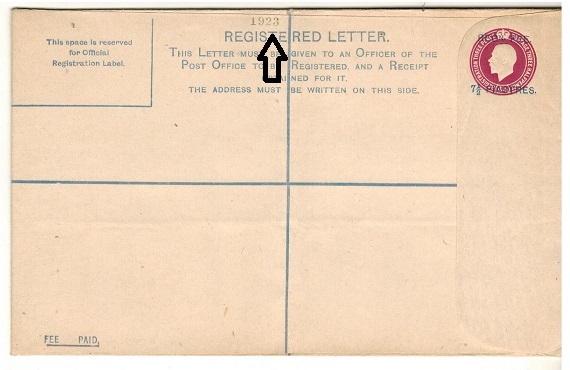 1922 7 1/2p on 4 1/2d claret on buff registered postal stationery envelope (size H) in fine unused condition with 'M.Q.' coding under flap. H&G 21b. BRITISH LEVANT - 1922 7 1/2p on 5d orange RPSE unused. H&G 20b. 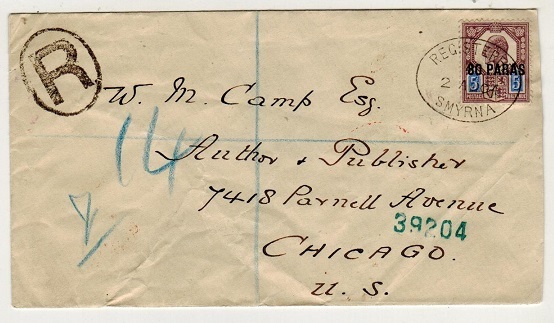 1921 7 1/2p on 5d orange on buff postal stationery envelope (size H) in fine unused condition showing the 'F.P.' coding under flap. 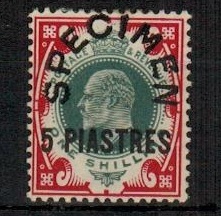 Small glue mark on reverse. H&G 20b. BRITISH LEVANT - 1893 40p on 2 1/2d PSE uprated and registered to Switzerland. H&G 1. 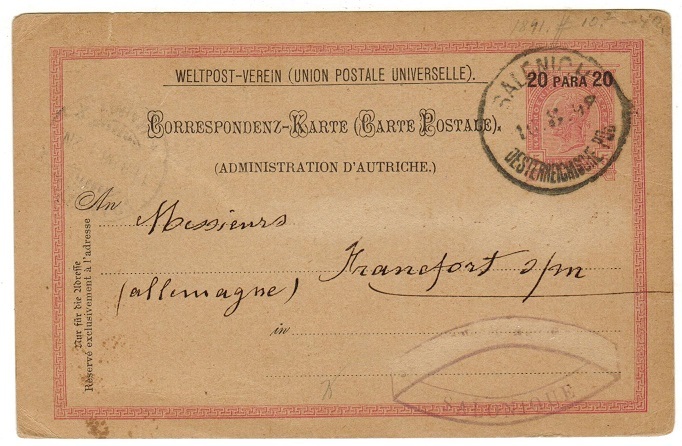 1893 40 paras black on 2 1/2d blue-grey postal stationery envelope registered to Switzerland bearing additional 40p on 2 1/2d adhesive tied by BRITISH POST OFFICE/STAMBOUL cds dated MR.22.95. A scarce registered use of this stationery. H&G 1. BRITISH LEVANT - 1911 1p rate cover to USA used at SALONICA. 1911 (MY.21.) 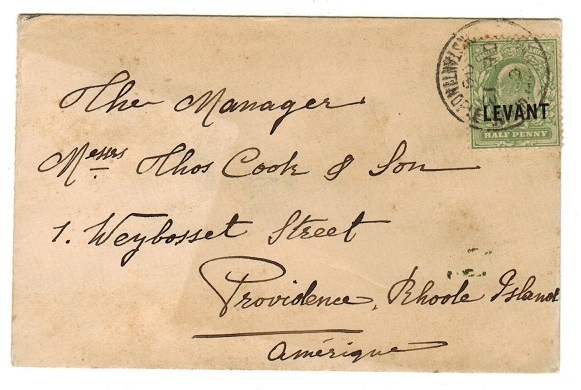 cover addressed to USA bearing 1p on 2 1/2d adhesive (SG 13) tied by BRITISH POST OFFICE/SALONICA cds. 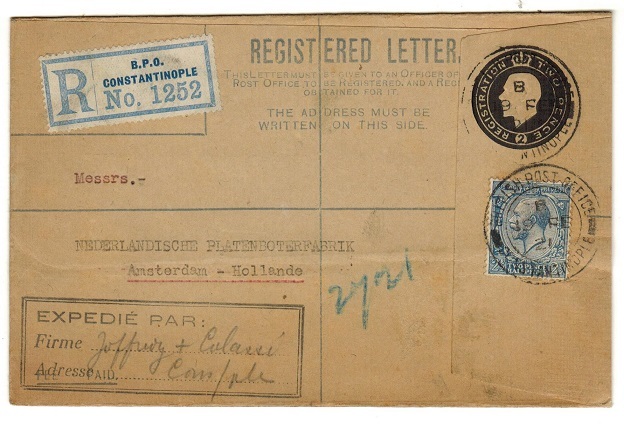 BRITISH LEVANT - 1915 2d black 'GB' military RPSE to Holland uprated at BPO/CONSTANTINOPLE. 1915 2d black on cream 'GB' Military and Occupation registered postal stationery envelope (size G) addressed to Holland bearing additional 'GB' 2 1/2d adhesive tied by BRITISH POST OFFICE/ CONSTANTINOPLE cds dated 19.FE.21 with blue on white perforated R/BPO/CONSTANTINOPLE registered label at left. (Br. Army PO). 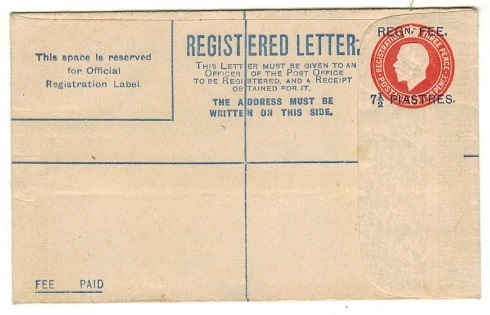 A scarce use of this military envelope in British Levant. 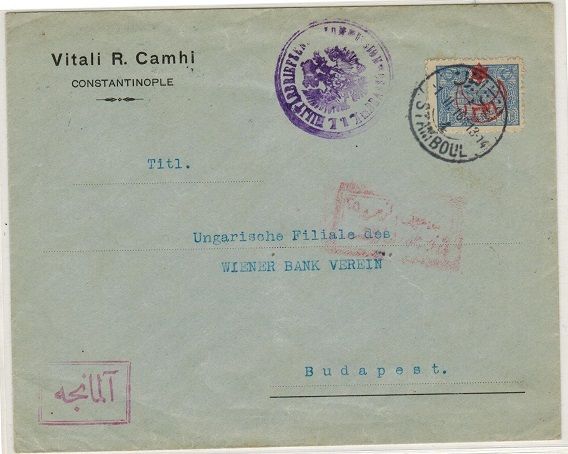 BRITISH LEVANT - 1922 cover to Malta used at CONSTANTINOPLE. 1922 (AP.14.) 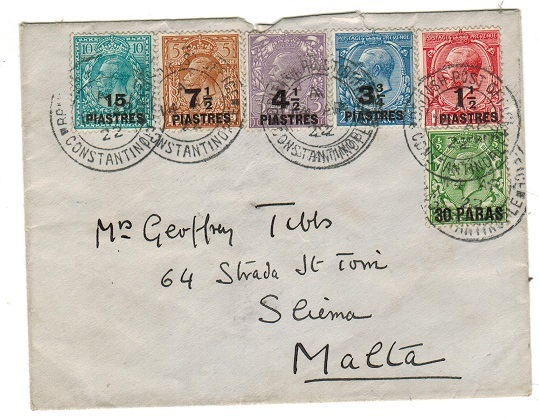 cover addressed to Malta (a little roughly opened on reverse flap) bearing the 1921 'Turkish Currency' short series from 30 paras to 15 piastres (SG 41-46) tied by d.r BPO CONSTANTINOPLE cds's. 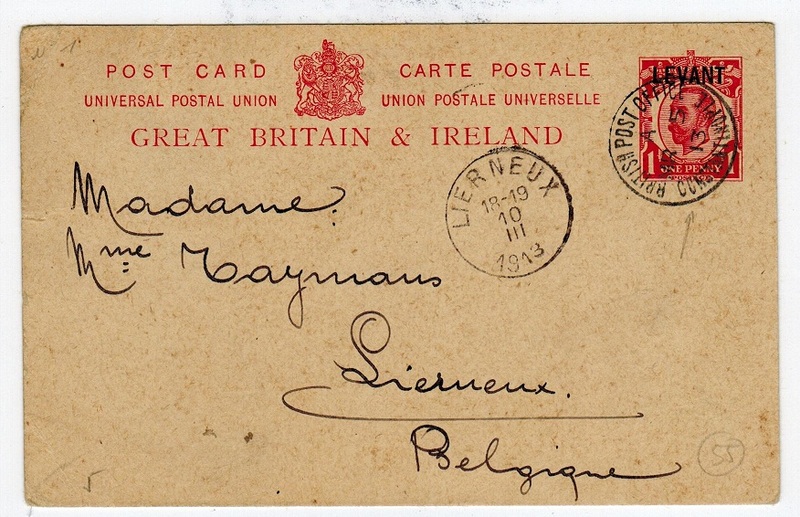 BRITISH LEVANT - 1904 postcard use to Belgium with GB 1/2d adhesive tied by s/r SMYRNA cds. 1904 (SP.27.) 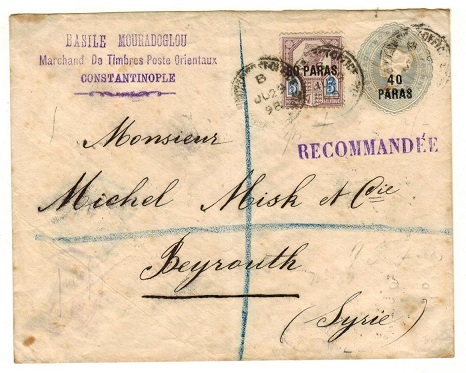 use of picture postcard addressed to Belgium depicting 'Mosquee Mufti Effendi at Smyrna' bearing GB 1/2d blue-green un-overprinted adhesive tied by BPO/SMYRNA cds. (SG Z267). BRITISH LEVANT - 1901 postcard use to France with GB 1/2d green pair used at CONSTANTINOPLE. 1901 (AP.20.) 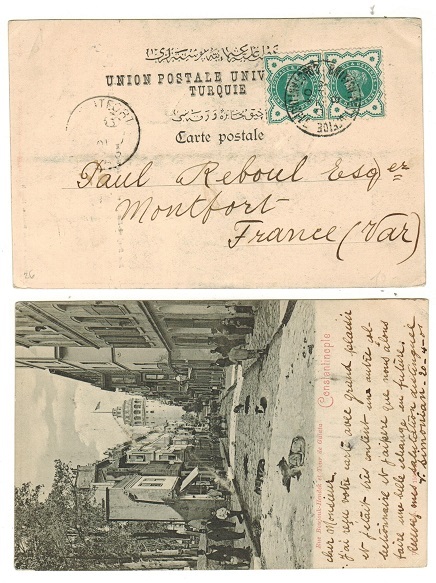 use of picture postcard addressed to France depicting 'Rue Boujouk-Hendek et Tour De Galata, Constantiople' bearing GB 'QV' 1/2d green unoverprinted adhesive pair tied by BRITISH POST OFFICE/CONSTANTINOPLE cds. BRITISH LEVANT - 1892 1d PSC of GB to Germany used at CONSTANTINOPLE. H&G 21. 1892 1d orange-red on cream postal stationery postcard of GB (H&G 21) addressed to Germany cancelled by BRITISH POST OFFICE/CONSTANTINOPLE and dated FE.21.93. GB stationery used in Levant. 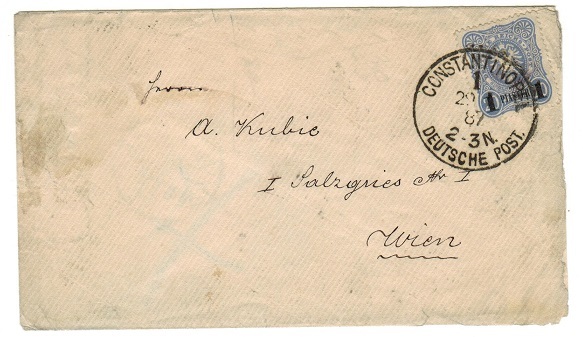 BRITISH LEVANT (Austrian Offices) - 1869 stampless cover to Italy used at SMIRNE. 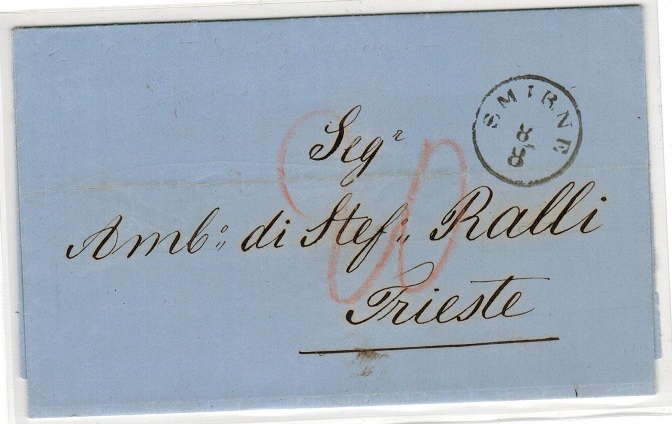 1869 stampless entire addressed to Italy cancelled by small circled SMIRNE cds dated 29/5/69 with oval TRIESTE arrival b/s. 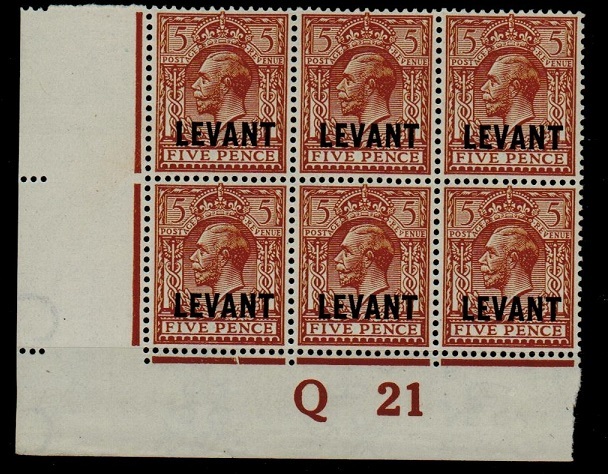 BRITISH LEVANT - 1921 5d yallow-grown 'Q21 (I)' mint control block of six. SG L21. 1921 5d Yellow-brown. A very fine mint Q21 (I) control blkx6 from plate 1C. SG L21. BRITISH LEVANT - 1905 postcard use from CONSTANTINOPLE. 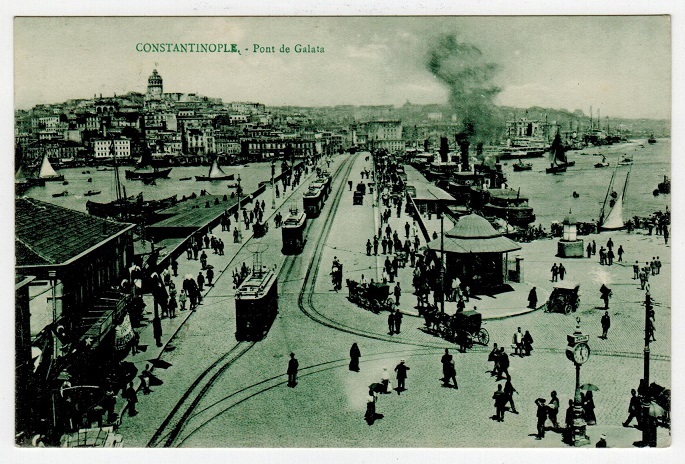 1905 (JY.21) use of coloured picture postcard addressed to UK depicting 'Quai de Bouyukdere' & bearing GB 1d adhesive tied by BRITISH POST OFFICE/CONSTANTINOPLE cds. Violet oval JOHN G. GRISCTI/SHIP CHANDLER/CONSTANTINOPLE cachet at left. 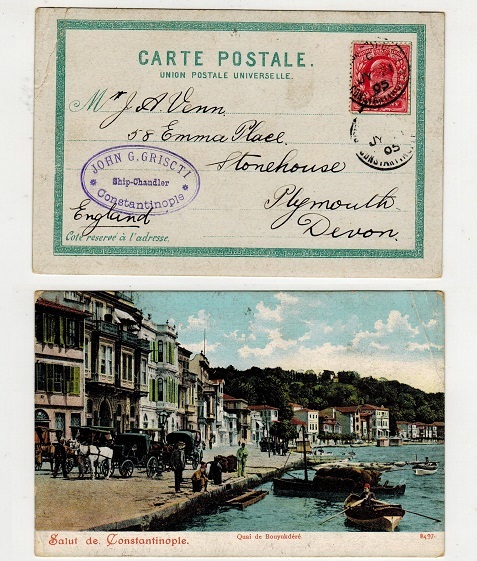 1905 use of coloured picture postcard addressed to UK depicting 'View of harbour' bearing 1/2d pair (SG L1) tied by BRITISH POST OFFICE/CONSTANTINOPOLE cds dated NO.13.05 with code D and fine bluish green oval GEORGE SACADAOH & CO/SHIP CHANDLERS/CONSTANTINOPLE commercial strike at lower left. BRITISH LEVANT - 1921 postcard use to UK with 2d un-overprinted adhesive used at CONSTANTINOPLE. 1921 (JY.18.) 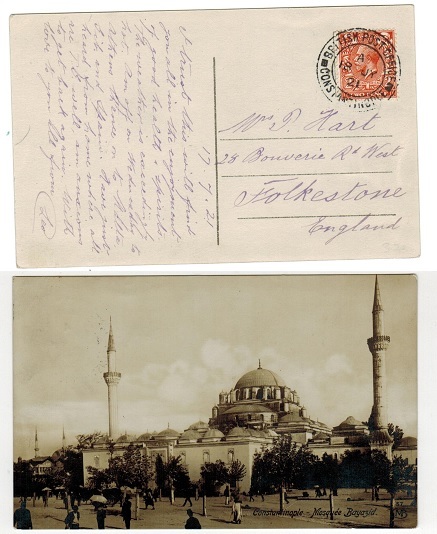 use of picture postcard addressed to UK depicting a mosque and bearing 'GB' 2d orange unoverprinted adhesive tied by BRITISH POST OFFICE/CONSTANTINOPLE cds. (SG Z191). 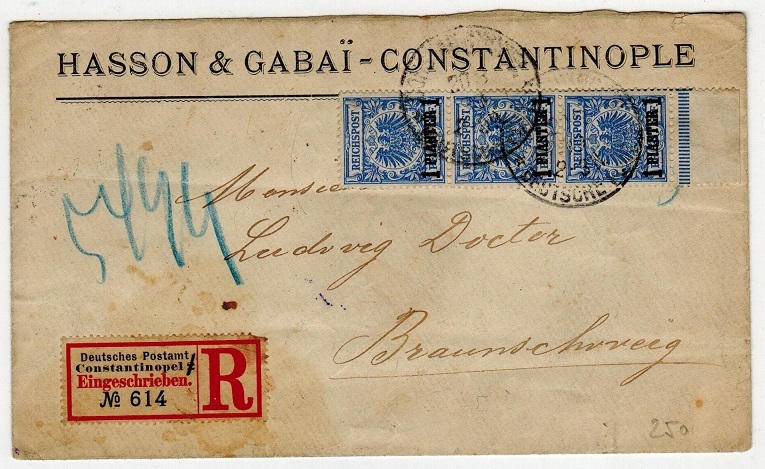 BRITISH LEVANT (German Offices) - 1887 1p on 20pfg cover to Austria used at CONSTANTINOPLE. 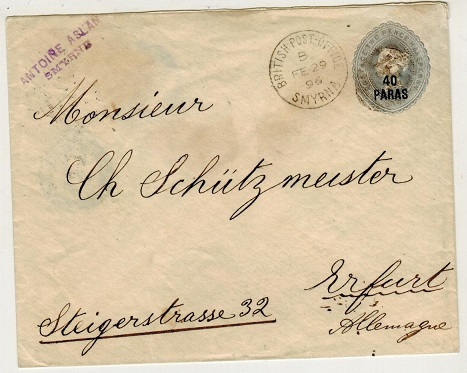 1887 cover addressed to Austria bearing German 20pfg ultramarine adhesive overprinted '1 Piaster 1' for use by the German Post Offices in Turkish Empire and cancelled by s/r CONSTANTINOPLE/DEUTSCHE POST cds with WIEN arrival b/s. BRITISH LEVANT (Austrian Offices) - 1852 stampless entire to Italy used at CONSTANTINOPLE. 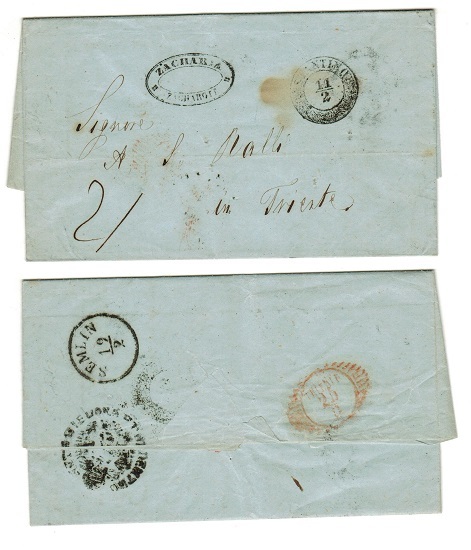 1852 stampless entire addressed to Italy with 'ZACHARIA' commercial oval h/s at left and cancelled by CONSTANTINOPLE (ornamentated bottom) d/r cancel with '11/2' dating in middle and with SEMLIN TRANSIT B/S AND RED trieste BARRED ARRIVAL. Black crested disinfection handstamp applied on reverse. 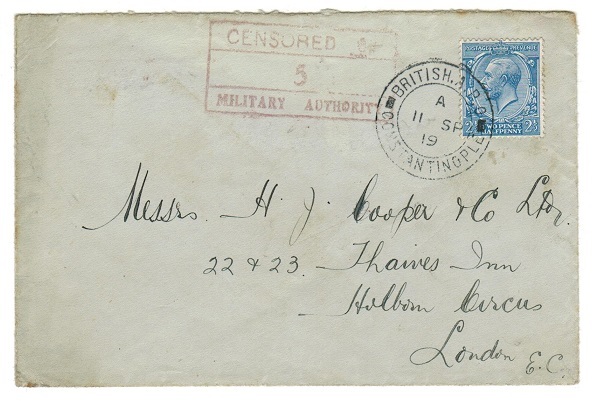 BRITISH LEVANT - 1919 2 1/2d rate military censor cover to UK. 1919 (SP.11.) 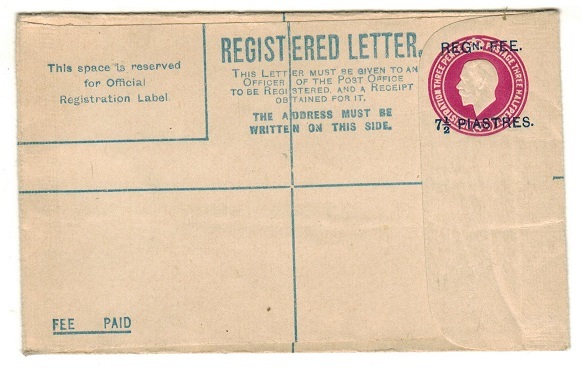 cover addressed to UK bearing 'GB' 2 1/2d adhesive tied by BRITISH A.P.O./ CONSTANTINOPLE cds with magenta box CENSORED BY/5/MILITARY AUTHORITY h/s at left. 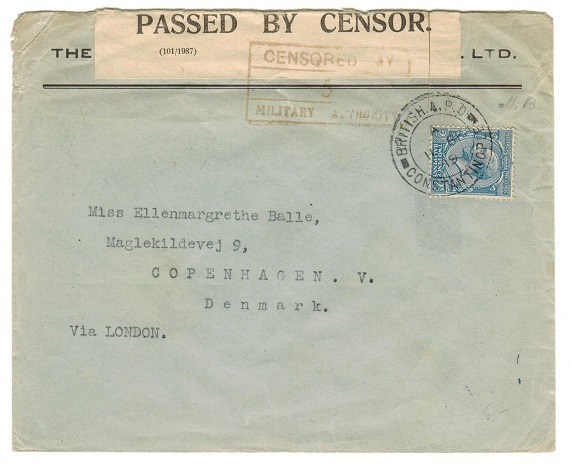 BRITISH LEVANT - 1919 2 1/2d rate military censor cover to Denmark. 1919 (SP.11.) cover addressed to Denmark bearing GB 2 1/2d blue adhesive tied by BRITISH A.P.O./ CONSTANTINOPLE cds with black on white PASSED BY CENSOR/(101/1987) censor label at top edge tied by boxed CENSORED BY/5/MILITARY AUTHORITY h/s. (GBOS type V). BRITISH LEVANT - 1921 1d rate (unoverprinted) postcard to UK used at CONSTANTINOPLE. 1921 (MR.5.) use of postcard addressed to UK depicting 'Monastere De Christos a Prinkipo' bearing GB (un-overprinted) 1d adhesive tied BRITISH POPST OFFICE/CONSTANTINOPLE. BRITISH LEVANT - 1902 24p on 5/- bright carmine adhesive mint. SG 12. 1905 24p on 5/- bright carmine 'De La Rue' printing adhesive in fine mint condition. SG 12. BRITISH LEVANT - 1902 12p on 2/6d dull purple on chalky paper mint. SG 11b. 1902-05 12p on 2/6d dull purple on chalky paper adhesive in fine mint condition. SG 11b. BRITISH LEVANT - 1912 24pi on 5/- carmine SOMERSET HOUSE printing fine mint. SG 34. 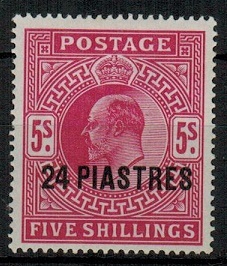 1912 24pi on 5/- carmine in fine mint condition of the scarcer Somerset House printing. SG 34. BRITISH LEVANT - 1905 1/2d mint 'J10' plate strip of three. SG L1. 1905 1/2d pale yellowish green in a fine mint strip of three showing 'J10 (I)' plate number in bottom margin. SG L1. 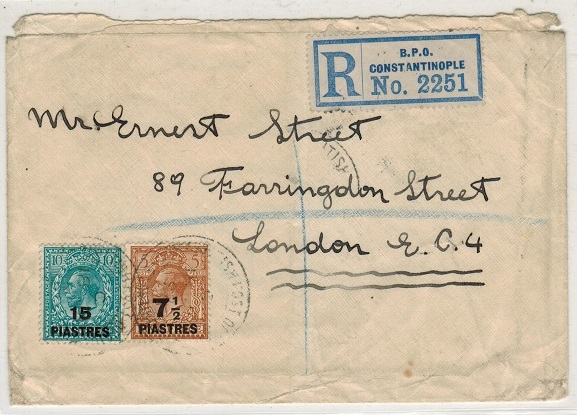 BRITISH LEVANT - 1922 7 1/2p on 5d rate cover used at CONSTANTINOPLE. 1922 (AP.12.) 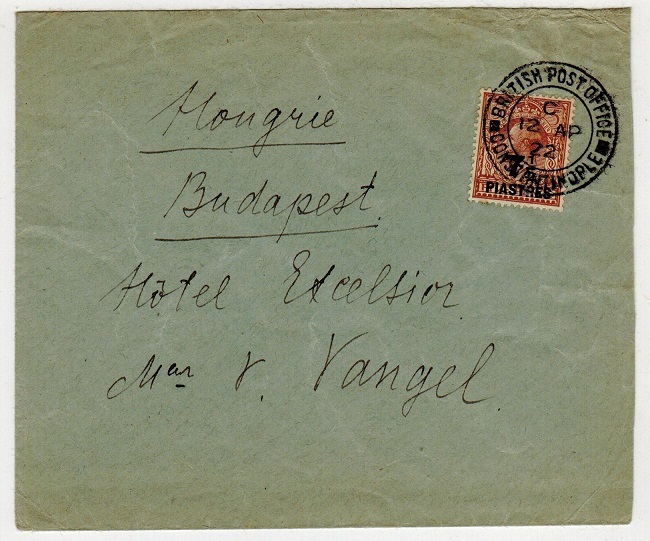 cover addressed to Budapest bearing 7 1/2p on 5d adhesive (SG 45) tied by BRITISH POST OFFICE/CONSTANTINOPLE cds. 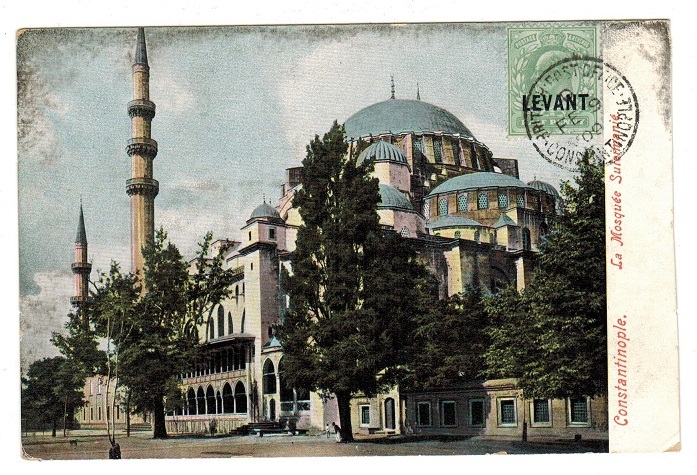 BRITISH LEVANT - 1922 4 1/2p on 3d postcard use to USA used at CONSTANTINOPLE. 1922 (MR.18.) use of picture postcard addressed to USA depicting 'Constantinope-Mosquee Suleymanie et la Corne d'Or' bearing 4 1/2p on 3d violet adhesive tied by BRITISH POST OFFICE/ CONSTANTINOPLE cds. BRITISH LEVANT (Austrian Offices) - 1891 20p on 5kr PSC used at SALONICH/DESTERREICHISCHE P.O. 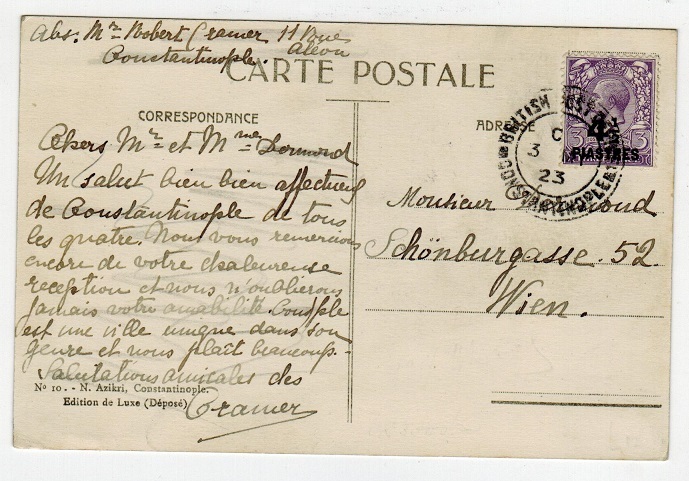 1891 20 para black on 5kr rose postal stationery postcard for use abroad (H&G 18) addressed to Germany (long message but vast amount being erased) cancelled by SALONICH/DESTERREICHISCHE PO cds dated 10.8.98 with violet SALONIQUE banded cachet at bottom. 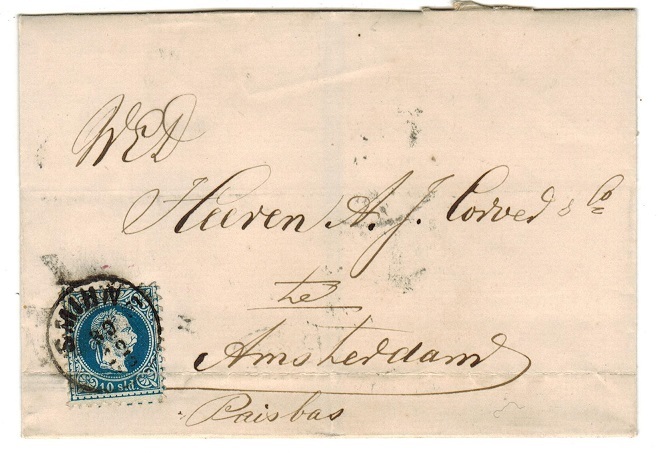 BRITISH LEVANT (Austrian Offices) - 1873 cover to Amsterdam bearing 10std used at SMIRNE. 1873 (30.12.) use of outer wrapper addressed to Amsterdam bearing 10std blue adhesive tied by SMIRNE cds. The wrapper with horizontal fold at bottom going through the bottom of the stamp. 1877 (AUG.19.) entire bearing 10+20l adhesives tied by Greek CONSTANTINOPLE cancel with green oval forwarding agent h/s below. BRITISH LEVANT (Austrian Offices) - 1862 stampless entire to Austria used at CONSTANTINOPLE. 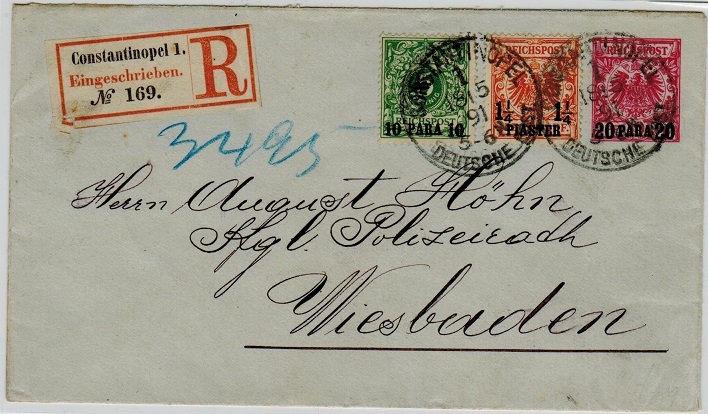 AUSTRIAN POST OFFICES - 1863 (25.10.) 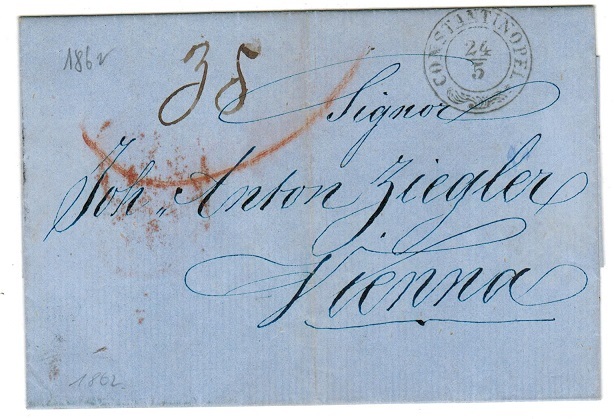 stampless entire addressed to Vienna rated '35' in manuscript and with d/r CONSTANTINOPLE cancel applied (with decoration at bottom) in blue. BRITISH LEVANT (Austrian Offices) - 1868 stampless entire to Italy used at SMIRNE. 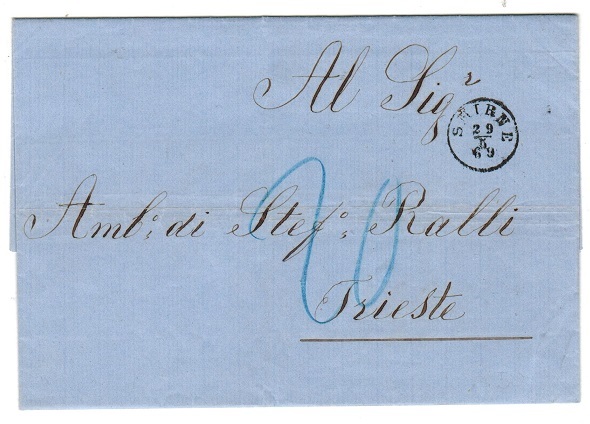 AUSTRIAN POST OFFICES IN LEVANT - 1868 (8.8.) stampless entire addressed to Italy cancelled by fine black s/r SMIRNE cds rated '80' in red crayon and with fine red oval TRIEST 13/8 arrival b/s. BRITISH LEVANT - 1920 2 1/2d rate (SG Z287) on cover to UK used at CONSTANTINOPLE. 1920 (AU.2.) cover addressed to UK bearing GB un-overprinted 2 1/2d adhesive (SG Z287) tied by s/r BRITISH POST OFFICE/CONSTANTINOPLE cds. 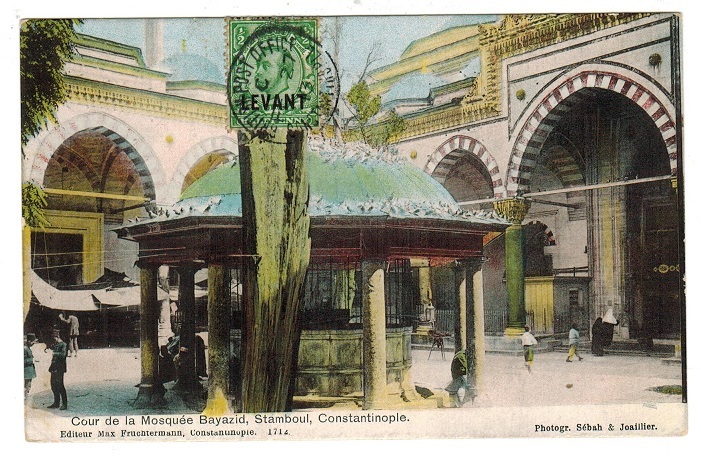 BRITISH LEVANT - 1912 1d rate postcard use to USA used at CONSTANTINOPLE. 1912 (JY.3.) 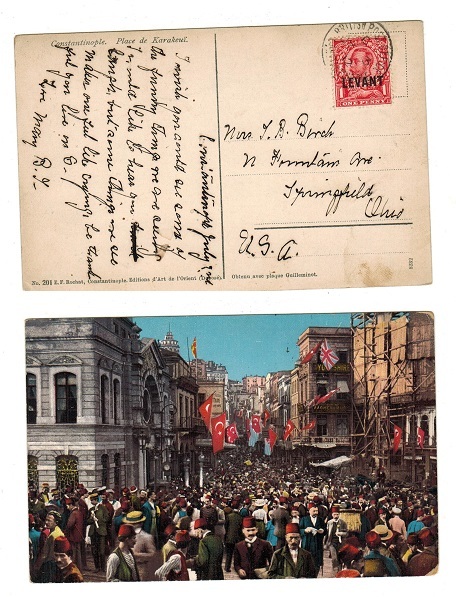 use of picture postcard addressed to USA depicting 'Place de Karakeui, Constantinople' bearing 1d 'Mackennal' adhesive overprinted LEVANT tied by BPO CONSTANTINOPLE cds. BRITISH LEVANT - 1909 1/2d rate postcard use to UK used at CONSTANTINOPLE. 1909 (FE.9.) 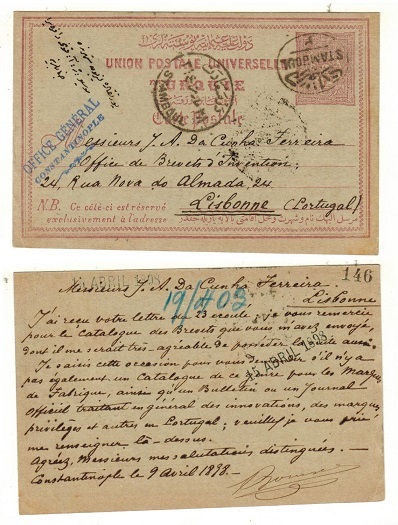 use of postcard addressed to UK depicting 'La Mosquee Sutermanie/Constantinople' bearing 1/2d 'Levant' overprint adhesive (SG L1) tied BPO/CONSTANTINOPLE. BRITISH LEVANT - 1899 40p on 2 1/2d rate cover to UK used at SMYRNA. 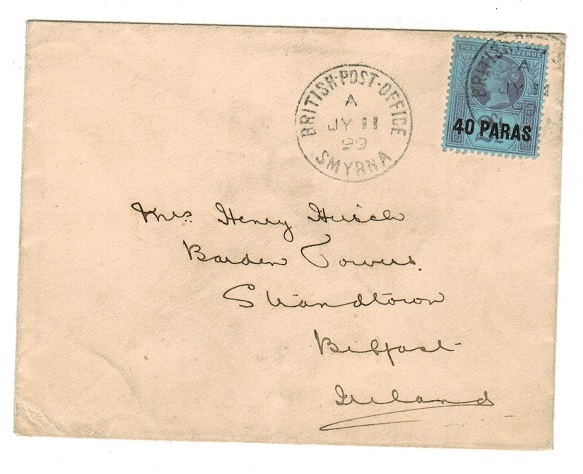 1899 (JY.11) cover to Ireland bearing 2 1/2d purple on blue adhesive (SG 4) tied by BRITISH POST OFFICE/SMYRNA cds. BRITISH LEVANT - 1909 1/2d rate cover to USA. 1909 (DE.13.) 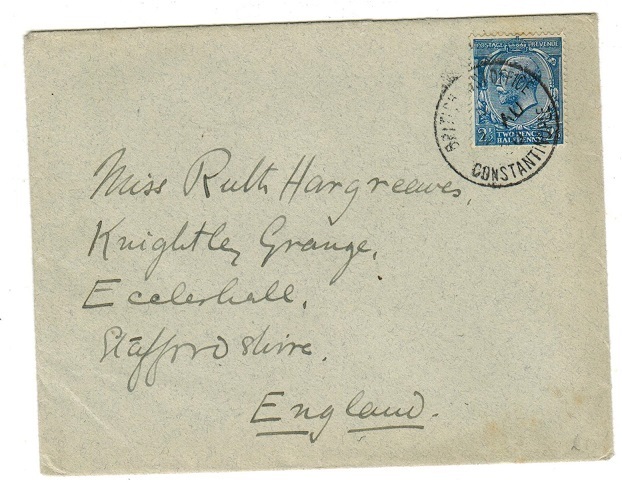 small sized cover addressed to USA (scarce) bearing Edward VII 1/2d yellow green adhesive of GB overprinted LEVANT and cancelled by BPO/CONSTANTINOPLE cds. BRITISH LEVANT - 1920 4 1/2p on 1 1/2d brown PSC to Germany used at CONSTANTINOPLE. H&G 24. 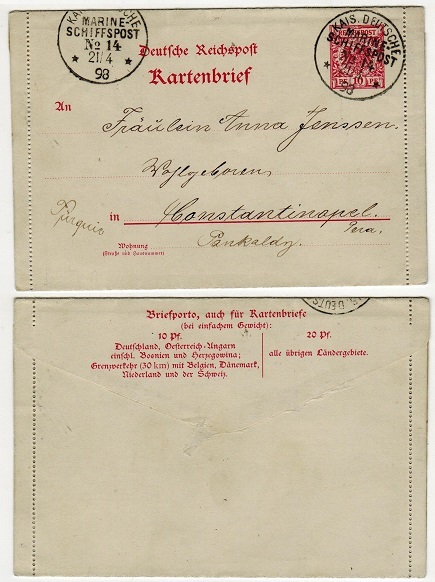 1920 4 1/2p on 1 1/2d brown postal stationery postcard addressed to Germany (genuine use) cancelled by BRITISH POST OFFICE/CONSTANTINOPLE cds dated 10.MY.22. H&G 24. 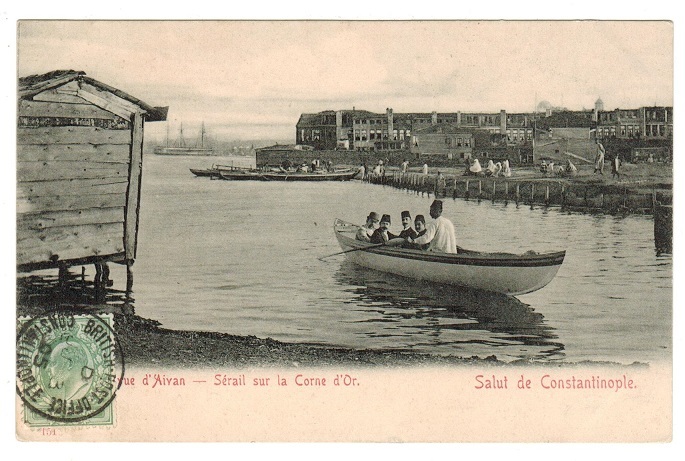 BRITISH LEVANT - 1905 1/2d rate postcard to France used at CONSTANTINOPLE with GB adhesive. 1905 (JU.3.) 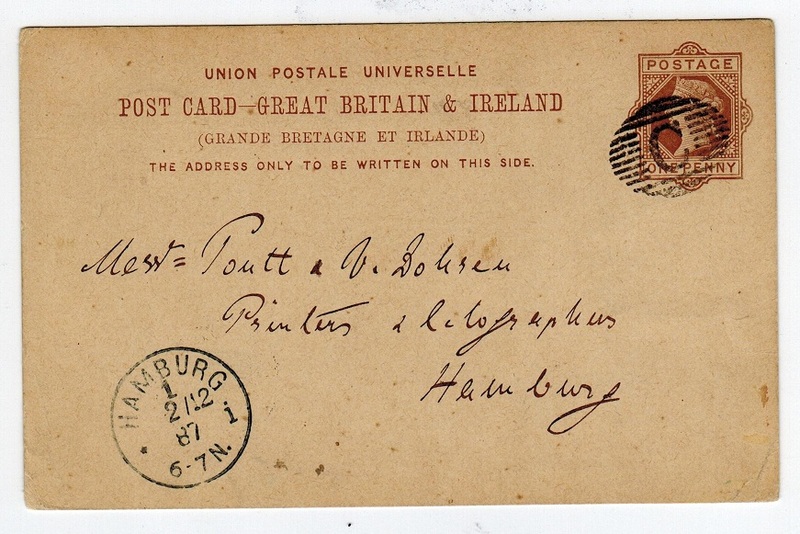 use of picture postcard addressed to France depicting 'Salut De Constantinople' and bearing 'GB' un-overprinted 1/2d green on picture side cancelled BRITISH POST OFFICE/ CONSTANTINOPLE. 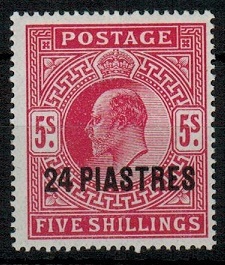 BRITISH LEVANT - 1911 1d scarlet mint C 12 (P) plate block of six. 1911-13 1d Scarlet 'C 12' plate block x 6 in fine mint condition. SG L17. BRITISH LEVANT - 1921 7 1/2p rate cover to Egypt used at CONSTANTINOPLE. 1921 (NO.3.) 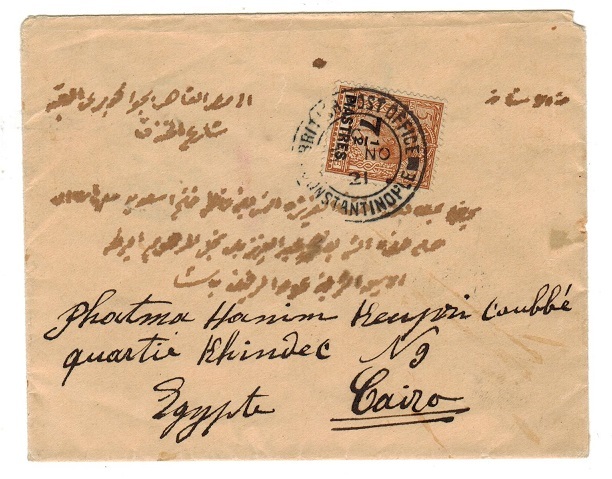 cover addressed to Egypt bearing 7 1/2p on 5d brown adhesive tied by BRITISH POST OFFICE/CONSTANTINOPLE cds. BRITISH LEVANT - 1898 GB 1d PSC to UK used at SMYRNA. H&G 21. 1898 (AP.4.) 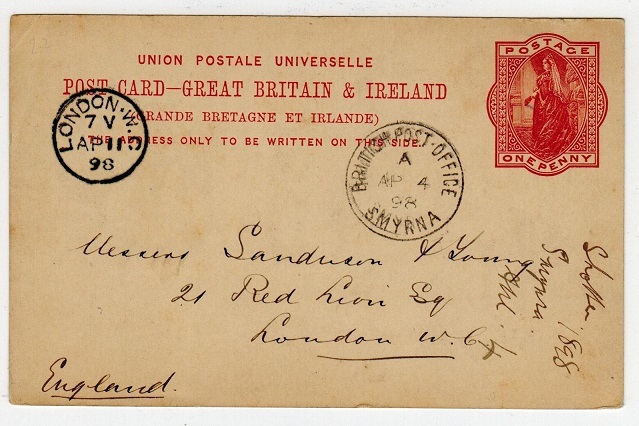 use of 'GB' 1d 'UPU' vermilion on cream postcard addressed to UK cancelled by BRITISH POST OFFICE/SMYRNA cds. GB un-overprinted stationery used in Levant. H&G 21. 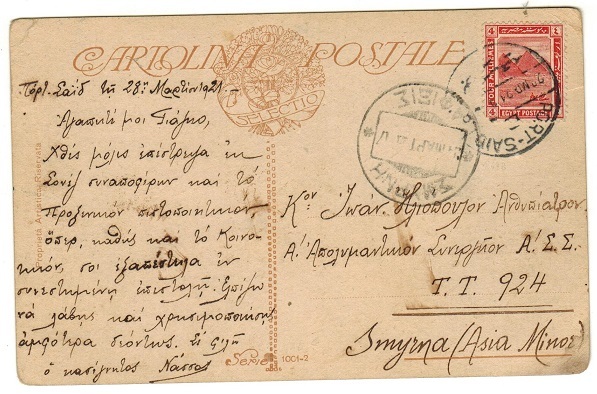 BRITISH LEVANT - 1923 4 1/2p on 3d rate postcard to Austria used at CONSTANTINOPLE. 1923 (MY.3.) 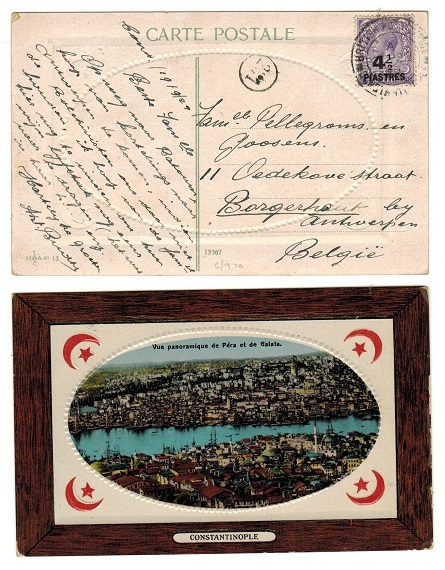 use of picture postcard addressed to Austria depicting 'Constantinople-Pont De Galata' and bearing the Turkish currency 4 1/2p on 3d violet adhesive (SG 44) tied by d/r BRITISH POST OFFICE/CONSTANTINOPLE cds. A nice genuine 'foreign postcard rate' use. BRITISH LEVANT - 1913 postcard to Switzerland bearing 1/2d 'Downey head' used at CONSTANTINOPLE. 1913 (FE.27.) 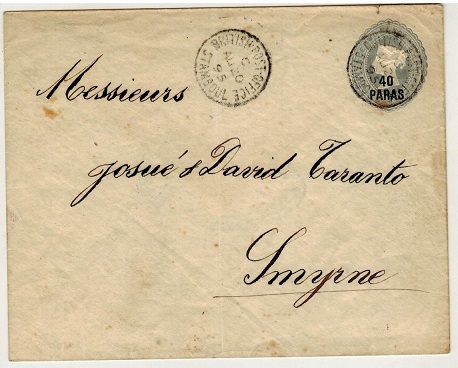 use of postcard addressed to Switzerland depicting 'Cour De la Mosquee Bayazid, Stamboul' bearing 1/2d 'Downey' head issue tied to picture isde by BRITISH POST OFFICE/ CONSTANTINOPLE cds. BRITISH LEVANT - 1920 BRITISH A.P.O./CONSTANTINOPLE cover to UK. 1920 (JY.1.) cover addressed to UK bearing 'GB' (un-overprinted) 2d (die I) pair, and 2 1/2d strip of three (SG Z179+180) tied by d/r BRITISH A.P.O./CONSTANTINOPLE cds's following the occupation by allied forces in Constantinople. 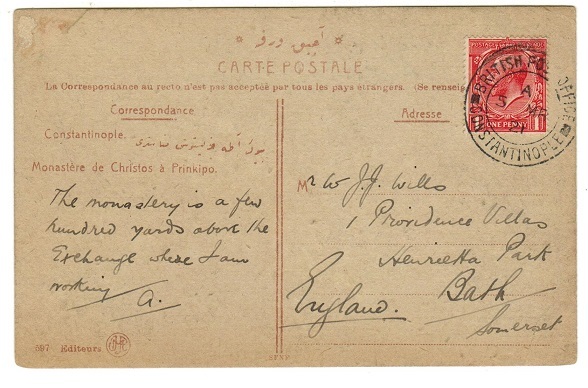 BRITISH LEVANT - 1920 4 1/2p on 1 1/2d PSC used locally with additional French/Italian office use. 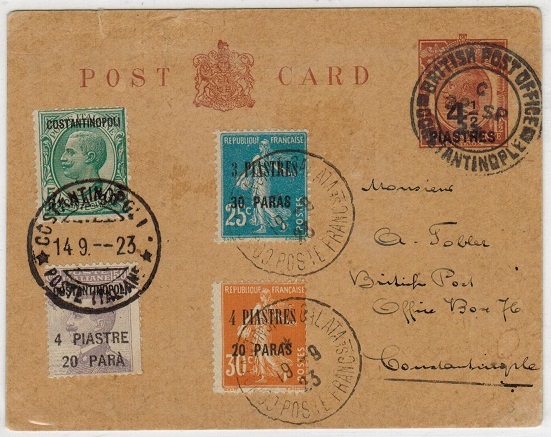 1920 4 1/2pi on 1 1/2d brown on buff postal stationery postcard addressed locally (no message) bearing Italian 5c overprinted CONSTANTINOPLE adhesive with 4p 20 para on 50c lilac tied CONSTANTINOPLE/POSTE ITALIANE dated 14.9.23 together with French surcharged 3p 30 paras on 25c blue and 4p 20 paras on 30c orange adhesives tied CONSTANTINOPLE GALATA cds's dated 19.9.23. 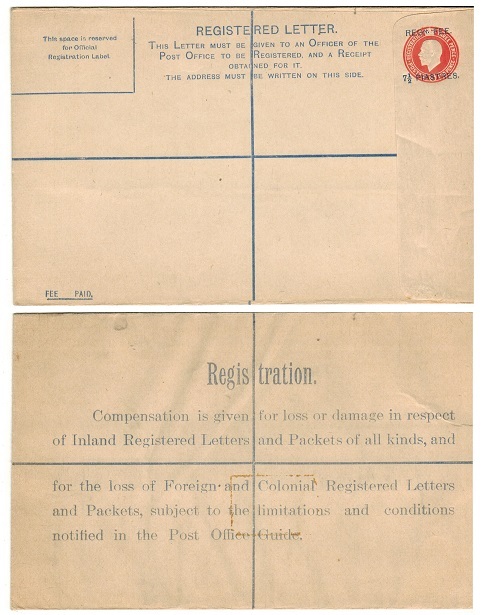 The card then being cancelled at the British Post Office by BRITISH POST OFFICE//CONSTANTINOPLE cds dated 22.SP.23. 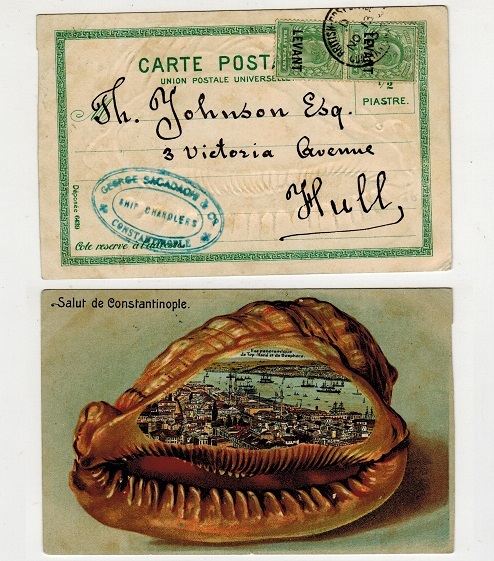 A scarce and unusual usage of this stationery postcard showing this Italian/French combination. H&G 24. BRITISH LEVANT - 1903 cover to UK with 40p on 2 1/2d used at SMYRNA. 1903 (SP.24.) neat cover addressed to UK bearing 40 paras on 2 1/2d (SG 8) tied by s/r BRITISH POST OFFICE/SMYRNA cds with 'A' slug coding. BRITISH LEVANT - 1898 use of GB 2d RPSE uprated with Levant 40 paras from CONSTANTINOPLE. 1898 (AU.24.) 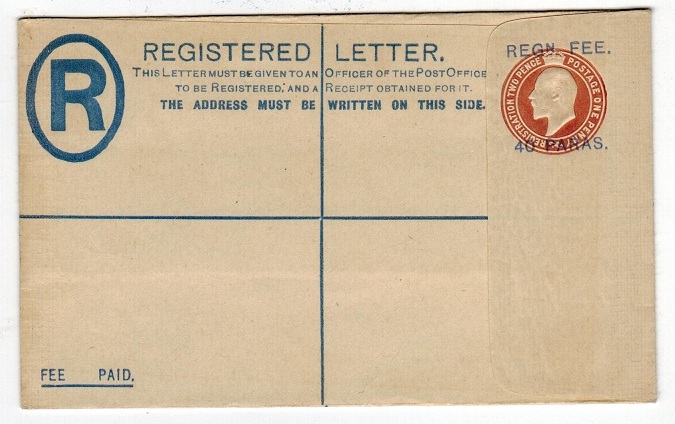 use of 'GB' QV 2d blue on cream registered postal stationery envelope (size G) addressed to UK and bearing additional 40 paras on 2 1/2d adhesive (SG 4) tied by BRITISH POST OFFICE/ CONSTANTINOPLE cds with "B" code slug. A use of GB stationery in British Levant. BRITISH LEVANT - 1909 30pa on 1 1/2d U/M pair with DATE CUTS. SG 16. 1909 30pa on 1 1/2d pale purple and green adhesive on chalky paper in a fine unmounted mint bottom left corner pair showing date cut in the marginal rule below Row 10/2. SG 16. BRITISH LEVANT - 1912 24pi on 5/- 'Somerset House' mint copy with DATE CUTS. SG 34. 1912 24pi on 5/- carmine 'Somerset House' printing adhesive in a fine mint bottom marginal example showing TWO DATE CUTS in marginal rule. SG 34. BRITISH LEVANT - 1902 40p on 2d+1d PSRE unused. H&G 14c. 1902 40 paras on 2d+1d brown on buff registered postal stationery envelope (size H2) in fine unused condition. H&G 14c. BRITISH LEVANT - 1902 40p on 2d+1d PSRE unused. H&G 14a. 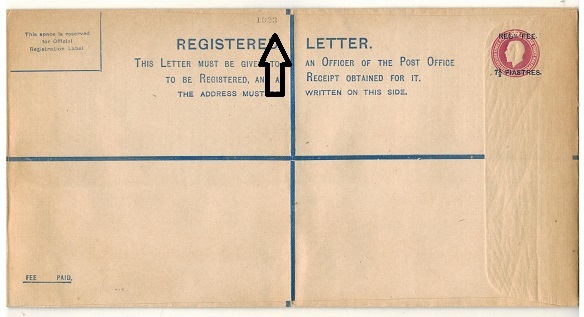 1902 40 paras on 2d+1d brown on cream registered postal stationery envelope (size G) in fine unused condition. H&G 14a. BRITISH LEVANT - 1902 40p on 2d+1d PSRE unused. H&G 14. 1902 40 paras on 2d+1d brown on cream registered postal stationery envelope (size F) in fine unused condition. H&G 14. BRITISH LEVANT - 1907 1p on 2d+1d RPSE to Germany uprated with 30p and 1/2d. H&G 16. 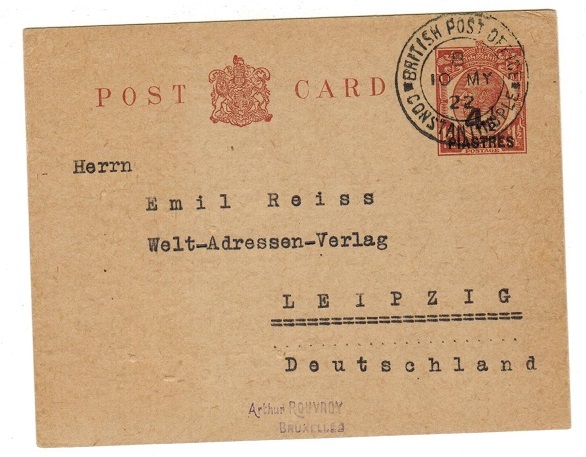 1907 1p on 2d+1d brown on cream registered postal stationery envelope (size G) addressed to Germany and bearing 30 paras on 1 1/2d adhesive tied in combination with 1/2d LEVANT overprint issue and tied by BRITISH POST OFFICE/CONSTANTINIOPLE cds dated SP.7.11. 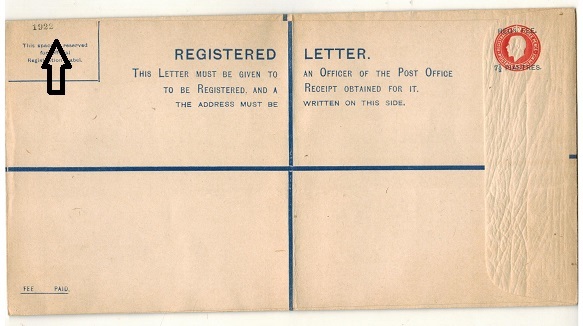 A fine and fresh example but the envelope has previously been mounted on the reverse with glue and hence has a large area of surface removed. H&G 16. 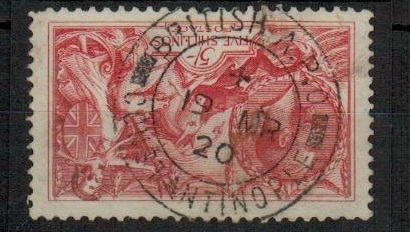 BRITISH LEVANT - 1912 1d PSC used from CONSTANTINOPLE. H&G 22. 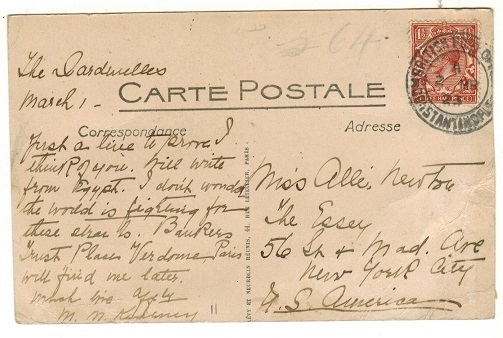 1912 1d carmine on buff postal stationery postcard addressed to Belgium & cancelled BPO/ CONSTANTINOPLE & dated MR.5.13 code A. H&G22. BRITISH LEVANT - 1883 GB 1d PSC used in Levant. 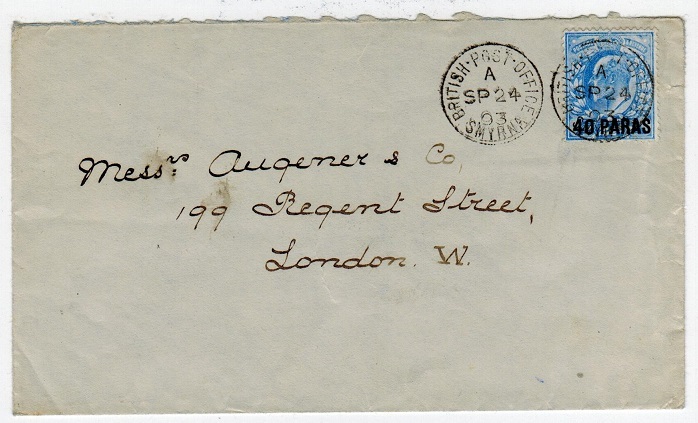 1883 1d brown on buff postal stationery postcard of GB (H&G 10) addressed to Germany (genuine use) cancelled by barred 'C' duplex of Constantinople with BPO/CONSTANTINOPLE transit b/s dated NO.29.87 and HAMBURG arrival on front. A fine commercial use.